How's the festival been going for you? I did opening night at the Chelsea Market, and I went to the WD-50 event with Ferran Adria and Alain Ducasse. I'm doing a closing party at the restaurant tonight. Jose Andres is hosting and Ferran is the special guest, and all kinds of media and guest will be there. How this festival different from South Beach? It's really different. I think of South Beach as a resort. It's more relaxing there, people are walking down the beach in sandals with no socks. But it's comfortable over here because it is my hometown. And my restaurant is here, so if something goes wrong or if something is missing I can have one of my chefs go get it and I can fix the problem. And here friends are able to stop by and see you. No, I don't even have time to see my wife. But, a lot of people know me from the show and they come by. A lot of fans? Yes, a lot of people are recognizing me and they come to my restaurant, which is just up the street. Are you working on any new projects? 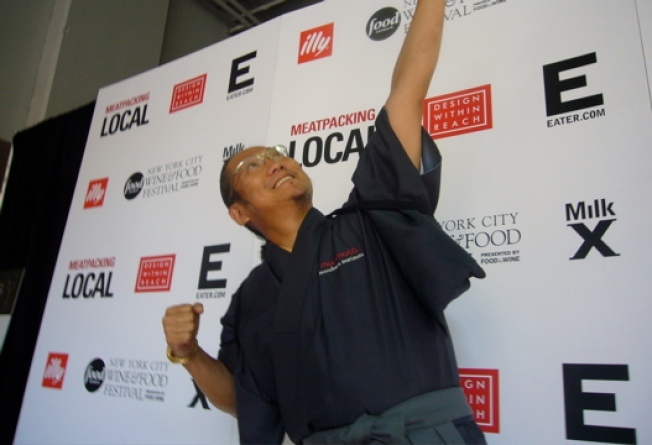 I just opened Morimoto Sushi Bar last Tuesday at the Boca Raton Resort. And, actually I try to export my food overseas, but I just don't have the time. New York is busy so busy, and I really like to be in my restaurant. I try to stay here as much as possible. I'm lucky to have a lot of business. There's the bad economy but the restaurant is busy, so I'm very lucky. We also appreciate the attention of the festival. What are your top five favorite restaurants in New York, places that if they closed you'd be devastated? I don't go out much. And I'm trying to lose weight. I lost 40 pounds already, and I'm trying to lose 20 more. It is my New Years resolution. But, If I have to go out after work, then maybe I go to Koreatown. That's where I eat seafood, congee. I love restaurants over there.